Jen-Hsun Huang is currently delivering the keynote speech of the GPU Technology Conference 2013. He shared some news on Nvidia's roadmap, epecially on Volta, Logan, and Parker. 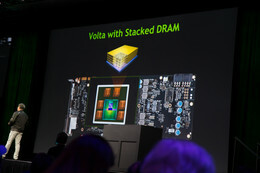 Not too many details were shared, but what I'm excited about the most is that Volta (the successor to Maxwell, which in turn will follow Kepler) will use a 3D chip stack to put the DRAM directly on top of the compute chip. Through-silicon vias will be used to connect the chips, enabling a bandwidth of 1 TB/s. For the Tegra line it was disclosed that Parker will use FinFET transistors. 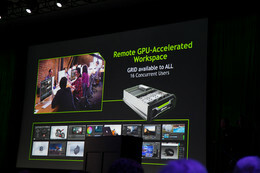 For the more immediate future Nvidia announced its first system: the Nvidia GRID visual computing applicance (VCA). GRID is a 2 socket system featuring Intel Xeon 8-core processors and features 384 GB of RAM. Inside there are 8 dual-chip Kepler class GPUs. 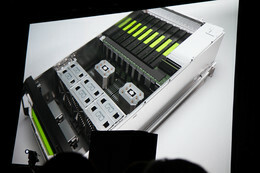 It can sustain 16 GPU-enabled virtual machines in parallel. GRID VCA can be thought of as a GPU mainframe. Prices range from $25k for the entry system and $40k for the max specification.